I’ve said before how I wish I were wealthy, so I could send each of my readers a package with one of each of my favorite diapers. Unfortunately for all of you (and me too), I’m not. I have however, gotten lots of great stuff because of this blog, and I just earned my first little bit of money. None of that would be possible without you. 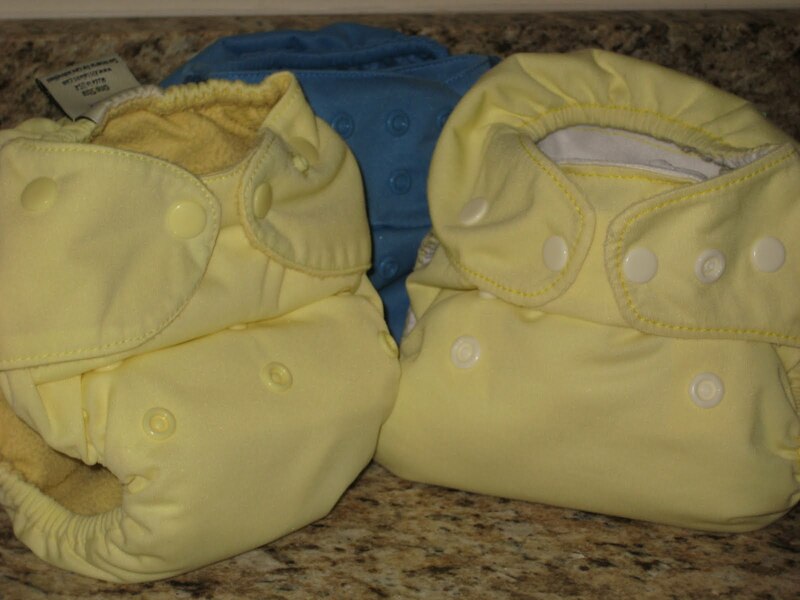 So, I decided to pay it forward and offer one blog reader a “mini stash” of three of my favorite diapers. Here’s the deal: This is just three of the diapers I like a lot. I have other favorites too. I don’t want my other diapers to be sad that these three were getting special attention! You’ll notice they are all snap closure diapers. That may seem strange since you probably know that I prefer aplix/Velcro for ease of use and adjustability. Unfortunately, I don’t have a single Velcro diaper that hasn’t given me some kind of trouble, usually from the aplix itself. It either immediately won’t stick to the laundry tabs, sticks too much and is difficult to remove, or is good initially but poops out over time. Also, my son has discovered the Velcro, so now as soon as I close a diaper, I hear “rrriiiipppppp.” Hee hee. Here’s how it’s going to work: Follow the “rules” at the bottom of the post as usual to get your entries. I’ve taken photos of my own diapers for this post, but the winner will choose their own. I buy them and have them shipped to you. The winner will give me a first and second color choice for each item! As of now, I’m planning to buy from Diaper Junction, but I reserve the right to change my place of purchase based on availability, price, or my whim. 🙂 Diaper Junction is one of a few online stores I like to buy from; they’re usually the second place I look, if my first choice is out of stock or doesn’t sell the item I’m looking for. They have a good selection and are usually well stocked. You have to spend $75 to get free shipping, but their shipping rates are very reasonable. You don’t have to pay $5 or $10 flat rate shipping charges for one item. The winner will get one Kissaluvs Marvels AIO, one Flip Diaper with stay dry insert, and one Smartipants diaper (insert included). 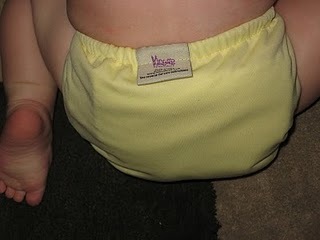 My Kissaluvs diaper was one I was blessed to receive as a review diaper. Click that link to read my full review. I haven’t quite been using my diaper for two months, but it quickly became a favorite. It’s an all in one diaper, but the insert is only sewn at one end. When I wash it, it turns completely inside out for thorough washing and faster drying. I haven’t had any stink issues, but the design would make it easy to remove the insert if you had to, and use it as a pocket diaper, or replace the insert. The Marvels AIO is one size by way of a snap down rise (my favorite) has the microfleece inner I prefer and has an easy snap setup. It fits wonderfully and doesn’t leak. It’s one of a few that I would grab if we were going out or if my son was getting ready to nap. It’s a little pricier than some others, but definitely not the most expensive. I bought my Flip when the Bumgenius spend $10 get a free AIO coupon was out. Again, you can click that link to read my full review. The flip is a hybrid or an all-in-two, depending on who you talk to. You can get stay dry, organic, or disposable inserts for it. Pairing the flip with inserts (changing the cover only when soiled, wiping between uses) or prefolds can be a very affordable way to get started in cloth. Again, it has a snap down rise to make it one size, and an easy snap closure. I only have the one insert, so after I’ve used it, I use the cover with my fitteds. It’s trimmer than a true cover would be, but it still works fine. It fits great, doesn’t leak and again, it’s one I reach for if my son may be in it for a while. I’ve been using my Smartipants diaper for over six months now. Initially, I wasn’t that impressed. It’s not that I didn’t like it, I just thought that it wasn’t that great. It didn’t seem like anything special, and it was only $3 cheaper than the Bumgenius 3.0, but didn’t include a doubler. The Smartipants is the perfect example of why I give things a good use, trying not to make a judgment based on initial impressions. I also think it’s smart to try different things, rather than put all your “eggs” in one basket. You never really know what you will like, or how your feelings will change over time! The common theme here of course is that it’s one size via a snap down rise, has a simple snap layout, fits well and seems to be leak proof. In fact, I keep this diaper upstairs, and if it’s clean, it’s the first one I put on my son in the morning. I just took this photo, so this is what it looks like after 6 months of nearly daily use! What’s unique about this diaper is that the insert goes under more of a patch of fabric than a pocket. 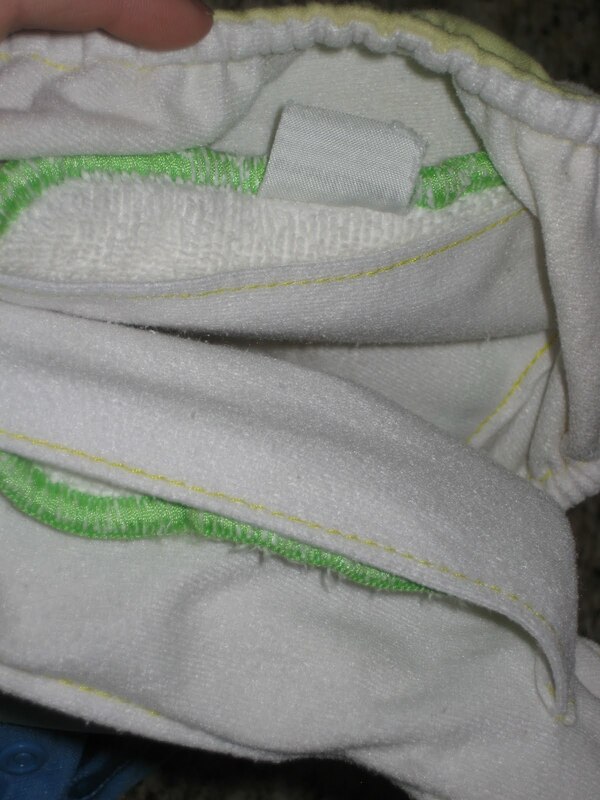 It has openings at the front and back, and the insert agitates out in the wash. With my other pocket diapers, I pull the inserts out before I put them in my wet bag, so I can just dump it in the washer on wash day (don’t want to touch them again, ick!) This one, I can put directly in the wet bag. Do any or all of the below. Leave a comment for each entry. Be sure to leave your email address in at least one of your comments, if it isn’t visible in your profile. This giveaway may seem swayed toward my followers since I’m offering some extra entries for using my button, adding me to your blogroll etc. That’s because it is. I want everyone to enter (hence the easy peasy entry as always) but hey, I want to encourage people to keep coming back and give my loyal readers a good chance to win! 1. Leave me a comment. Anything you’d like to say. What’s your favorite diaper? What’s the first cloth diaper you used? Have your likes changed over time? What would you like to see me review or give away? Do you like how I run my giveaways? Any other entry options you’d like to see? Are there too many? You don’t have to answer all that, just some ideas of what to talk to me about! 2. Follow my blog. Your choice of Google friend connect, RSS feed or email. 3. Like me on Facebook. 6. Blog about this giveaway and link back here. 8. List me on your blog roll, leave me a link to it. I will accept entries until Thursday, July 8th, 2010 at 9 P.M., Eastern. I’ll select a winner with random.org’s true random number generator and notify the winner by email. The winner has 48 hours to respond before the prize is forfeited and a new winner is chosen. Please note that this giveaway is not approved by, endorsed by or affiliated with the above diaper companies, or any diaper retailer. Quick reminders to please send me a message if you’d like to be listed on my blogroll or if you have a link that should be included on my link page, or if you know of an affiliate program you think I may like to add to the bottom of that link page. Also if you have any questions or have suggestions for reviews or giveaways! >I'm a fan on FB! >The first cloth diaper I used was the gDiaper system, and I used it first as a hybrid with the throwaway/compostable inserts. Then my DD started getting a rash from them, so we purchased some of their cloth inserts. I have since added to my stash with some organic cotton prefolds, a Flip (I went for the AIO coupon, too), a BumGenius 3.0, and some Bumboo Bamboo/Silk fitteds. Honestly, I love all of my cloth, although I have been a little disappointed in the quality of the gDiapers. After using them for about 6 months, the covers are already showing quite a bit of wear. I love my Flip, too, and would love to get more and the Bumboos are fabulous! So soft! That is my nighttime diaper, paired with a Disana wool soaker. >I am a bumGenius AIO fan. I prefer the velcro closers. I have also found antsy pants, which I LOVE, since my little guy is on his way to potty training! >Going to give smartipants a try.Jenn@euseb.org. >I am a newbie and am still hesitant to go all the way with cloth. I use Gro-baby diapers as they were discounted before the new Gro-Via. I would like to use some FuzziBunz too. >We are expecting our first child next month and planning to CD. Wish us luck! >I have five kids and have used cloth wipes with all of them. I'd like to try the cloth diapers with my twins. We go through a lot of diapers! >I am a facebook fan! >My first cloth diaper was a purple WAHM pocket I got from diaperswappers. And it was a piece of junk! Thankfully, I kept at it and got some diapers that did what they were supposed to do! After 8ish months, I'd have to say my favorite diaper is our one lonely Katydid. Super awesome diaper!! >Found your blog and going to become a follower as I start this journey!! >Already Like you on Facebook. >I just started using cloth a few months ago. My current favorites are Rumparooz, FuzziBunz, Knickernappies and GroVia. I haven't tried any of the diapers you are giving away so winning this would be awesome! >following your blog via e-mail! >First one I tried was a FuzziBunz. Haven't been able to try Smartipants, Kissaluv, OR Flip. I would love to though! e-mail: carlee dot henry at yahoo dot com. >I like you on FB. >My favorite cloth diaper right now is Gdiapers. I started out CDing with prefolds and covers, then went to fuzzibunz, and back to prefolds. Now I love Gdiapers. They are so easy to use. >I "liked" you on facebook! >I subscribed through the feedburner/e-mail! >I prefer velcro to, but don't hav emany anymore. It just looks so ragged after while and my LO has begun ripping his velcro diapers off. I've learned to love my snapping diapers much more after that! >Thanks for this give-away, too! What a fun blog!~Sarah (tsoldre @ msn.com)Oh, and I love the cool blue color of dipe! >I Like you on Facebook. >I just found you from prizey for another giveaway – THANKS!We are mostly a bumGenius family here at our house! >those look like great options! i'm new to the whole cloth diapering thing, so i'm trying to learn a lot right now. i love the butternut and butter yellow colors, as well as the seaspray. >I'm pregnant. I just found out. My son is 11 months. I need new diapers now. That is all. >Sounds like a great bunch to get started with. I would love to win these! >I subscribe to your blog in a RSS feed also! >We love the Smartipants too. 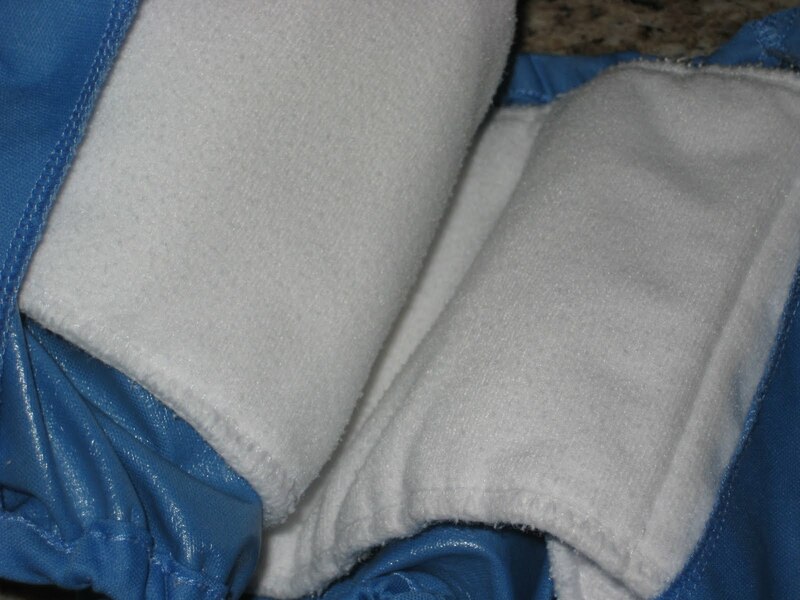 They are so easy to wash and have stayed stain free for about 9 months now! I would love to try the flip cover since it has snap closures. My toddler can rip off aplix very quickly! >I'm a new follower of your blog! >I just found your blog yesterday and I'm so glad! It's so awesome to keep readers updated about cloth diapering and even more awesome that you want to do giveaways so that your readers can try out products that have worked out so well for you! >I'm following your blog via Google reader. >I'm following you on Twitter. 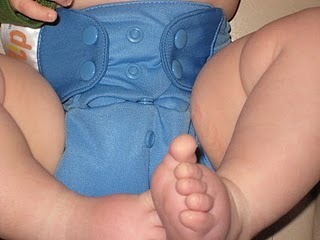 >I've mostly been using prefolds and diaper covers, but have been doing some research on AIOs and pocket diapers. Would love to give these 3 a try. >my new favorite is the Bumgenius all in one organic diaper. I was always a pocket girl but i'm kinda lovin these all in ones. >I would like to post a follow up. I loved the Fuzzibunz diapers and when I decided to purchase them they were made in the USA (a big selling point for me!) but now they have moved their manufacturing to CHINA and I am in search for a new favorite… so sad! I am hopeful if enough people tell them they need to come home or have a line made in the USA or Canada that we will have some more options. >I liked your facebook page. >My favorite diaper is the second diaper I tried, Fuzzi Bunz. Really, nothing I've tried compares to them for daytime and occasional nighttime use. They're both functional and really cute. I also like bumGenius pockets, but I have some trouble with odors. For covers, I use a Wonderwraps cover and a Thirsties cover, those are my two favorites, I also have Econobum and wool (love wool for nighttime). I still haven't tried Flip, so I hope I win so I can give it a shot! >Follow publicly through Google Friend Connect. >The first coth diaper I used was a bumgenious 3.0. My little one looked so huge in it, and my husband was worried because she couldn't lie flat in it because it was so big on her. >I love the soft bums diaper.. their absorbent snap in inserts, their leg elastic adjustments, and their adorable prints and colors. >I follow you via googleconnect. >My favorite CD is Grobaby, so easy to use and we've never had a leak! >The bulk of our stash is Smartipants (12 of 'em) but we have 2 BG, a FB and a few Thirsties covers. Nighttime diapering is our biggest struggle. Just when we think we've figured it out, he will start to leak out the top again. We've been using disposables at night until we can fix the CD option 🙁 Right now I am about to try some Loopy Do inserts to see if that helps. I hope so! >I follow your blog on GFC. >It's refreshing to see only 8 ways to enter – I get overwhelmed when there are so many options! >The Flip was the first cloth diaper I tried and I LOVE IT!!! >I have subscribed to your blog. >I've really been wanting to try the flip! >I follow on Google Friend Connect. >I have only used GDiapers, so I'd love to try these other kinds of cloth diapers! >I blogged about the giveaway @ therabbitthutch.blogspot.com! >I tweeted about the giveaway @guggiedaly! >I follow your blog via google connect. >This is a really creative giveaway! It'd be so much fun to try out three different diapers. I was introduced to cding by a friend who gave me a FB AIO. Then I tried grobaby. If my budget allowed it, I would try all kinds of diapers! >I love this! I want more flips!! >Most of my stash is Sammy's though I've been liking the BumGenius Organic AIO and the Green Acre Designs AIO for trips outside the house. >My favorite diaper is probably the Bumgenius 3.0. That is what my baby girl wears at night or naptime. I also like the Flip and would like more than the 1 I have. The Thirsties Duo covers aren't bad either, but I have the size 1 and she is starting to be too big for them. Thanks for the chance to win. >I follow your blog via friend connect. >My favorite diaper is the Bum Genius all in one. I love them and have a bunch in my stash. >"Like" you on FB – thanks! >I may be pregnant with my second (too early for a test!) and would love to cloth diaper. Thanks! >I love your giveaways! My first diaper was fuzzibunz, and it's still my favorite! I really want to try the smartipants. We have the same favorite stores! Abby's lane and diaper junction. I live in VA, so I like to support local. And Diaper Junction ships free to VA. I just ordered from them yesterday! >I use fitteds with wool. But now I'm trying hybrids. I currently have a couple grobaby and grovias. >I would love to win this–I've never tried any of these diapers before, but my favorite diaper right now is the BumGenius organic AIO! >I follow you with GFC! >I follow your blog with GFCtheaguilars at verizon dot netMy email is wrong on my last comment!